The Dotklok is an LED matrix (available in red or green) clock built and designed by Andrew O’Malley. The clock is sold as a kit for $150 or fully assembled for $200. Most importantly - this little thing rocks. Clearly, this is not a vacuum tube clock. However, I was drawn to it because it is one of the few LED clocks that does not use 7 segment displays and clearly a lot of effort went in to designing the display patterns. In fact, this clock offers over fourteen different animations ranging from Space Invaders to Pong. Can’t decide on which one to use? Let the clock pick a new one at random every day. The clock itself features a dedicated real time clock that is able to keep the time and date accurate when the power fails. The display is made up if a 24x16 pixel grid which works out to be 384 dots (or 0.000384 mega pixels @ 1 bpp). The display is 3 ¾ inches wide by 2 ½ inches tall (10cm x 6.5cm). When purchasing this clock, you can specify either a red or green matrix. The CPU is an ATmega328 running the famous Arduino boot loader. That, coupled with the fact that you can bring your own FTDI cable means that this is defiantly a hacker-friendly device. 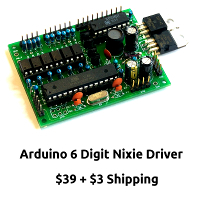 Andrew even includes the source code and schematics for download on his site. All of this work is released under the Creative Commons ShareAlike license. The enclosure is made up of two pieces of smoke colored acrylic separated by four metal standoffs. There are four buttons which are drilled and mounted in to the front of the enclosure and appear to be very solidly constructed. The electronics are mounted on two separate boards. The back-most board houses the microprocessor for the device along with the RTC, the battery backup, programming interface, etc. The front board is the display and it is connected by a ribbon cable. The only slight complaint I have about the construction is that in order to push the front buttons you must grip the back of the unit as well; this is necessary to provide enough pressure to depress the button. On its own this is not a bad thing but it does mean that fingerprints collect on the device because, if you're like me, you can't leave it alone. This clock has some really cool display effects, some that are more abstract, and some that are in between. For example, the Pong clock is easy to read and functions well as both a clock and as eye candy. On the other end of the spectrum is what I will call the "random dot fill" pattern. The clock starts off (at midnight) with none of the LEDs illuminated and, at regular intervals, light up random LEDs until the display is solid green (immediately before it resets at midnight.) The random dot fill effect is cool but it isn't possible to get an accurate time off of it. In the middle is the percentage readout. The clock displays the day as a percentage complete. So, instead of noon, the clock shows that the day is 50.00% complete. This too doesn't give a specific time reading but it is an interesting way to think about time. The best thing that I've found is to set it on random and enjoy a new one every day. Be sure to watch the last part of my video review to see these displays in action. Totally hackable: circuit board has prototype area and all unused Arduino pins are available; add more switches, buzzers, sensors! I really like this little gadget and I would recommend it - even if you can't assemble the kit yourself, the pre-assembled version is a polished product that shouldn't be hard for anyone to use. I also want to thank Andrew for lending me one of his clocks to review - thank you! As usual - you you have any questions, leave them in the comments and I'll do my best to answer them myself or find an answer for you!